Glenn recognized his interest for art at the age of 13. However, he didn’t realize his fascination for traditional painting methods until his early 20’s. In particular, the methods employed by the artists of the Early California Impressionist School, with an emphasis on unified color, sound design and simple forms derived from nature. Basically a self-taught artist, Glenn has a passion for discovering answers to the complexities found in the works of the past masters. 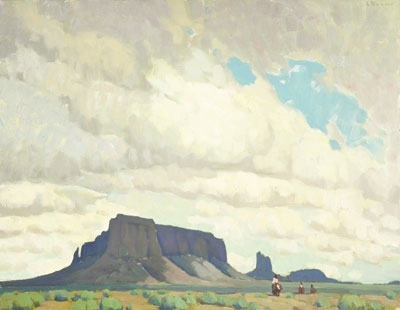 In particular, the works of Maynard Dixon, Armin Hansen, Edgar Payne, William Wendt, Hanson Puthuff and William Ritschell to name just a few. These artists went beyond the two dimensional surface of painting into the spiritual realm of beauty. Glenn defines this as a force or a connection that exists between man, God, and nature. Glenn’s passion for learning may have been what led him to become an amateur champion body boarder at the age of 19. Glenn’s short body boarding career ended after realizing the unlimited amount of concepts to be learned and practiced in art. Glenn responds most strongly to the infinite possibilities and qualities found in nature. This response instinctively leads Glenn to painting outside, on-location. He works on location throughout the Southwest, dividing his time between deserts, mountains, and coastal subjects. To Glenn, time in the field and in the studio are equally important. In his studio, Glenn develops larger compositions worked from field studies and other references. Glenn’s studio and home is on the Central Coast of California. This article was excerpted from Canyon Road Arts: The Complete Visitors Guide to Arts, Dining and Santa Fe Lifestyle, Vol 1, 2005-2006, page 45. Canyon Road Arts is published by Medicine Man Gallery. All rights reserved.